Servant Leadership In Action (How You Can Achieve Great Relationships and Results); a collection of essays edited by Ken Blanchard and Renee Broadwell, published by Berrett-Koehler Publishers, Inc., March 2018. As someone who unflinchingly believes that real, effective, positive leadership is rooted in service, I was very excited when the opportunity to review this book was presented. Once it arrived, my anticipation only increased as I saw the amazing list of forty-four contributors, including many of my favorites: Simon Sinek, Marshall Goldsmith, Brene’ Brown, Patrick Lencioni, Mark Sanborn, Laurie Beth Jones, Jon Gordon, Henry Cloud, Jim Kouzes, James Posner and, of course, Ken Blanchard. Servant Leadership In Action is a comprehensive and inspiring book presented as a servant leadership primer, action plan and how-to guide, then concludes with proof of effectiveness and inspiration to go forward. Each essay is three to five pages and includes a brief and personal introduction by Ken Blanchard which helps to focus the reader on what message may be received through our reading and reflection. Part One: Fundamentals of Servant Leadership – In Chapter 2, Larry C. Spears succinctly writes about ten characteristics of servant leaders and how they contribute to the meaningful practice of servant leadership. Part Two: Elements of Servant Leadership – In Chapter 15, Craig Groeschel writes about compassion and the heart of servant leadership. He challenges us to shift from feeling to doing and how that doing can change lives. Part Three: Lessons in Servant Leadership – As an Army Mom, I was particularly interested in Chapter 22, in which Jeffrey W, Foley writes about five Army-tested lessons of servant leadership. If you think it’s all “soft stuff”, start with this one! Part Four: Exemplars of Servant Leadership – I enjoyed Tamika Catching’s essay about legendary coach Pat Summitt in Chapter 28. Titled “Steely Eyes, Servant Heart,” it is another example that high expectations and strong discipline are not in conflict with servant leadership. Consider posting Summitt’s “Definite Dozen” rules for success in your workplace! Part Five: Putting Servant Leadership to Work – Chapter 35 was written by Dave Ramsey and powerfully describes the awesome responsibility of leadership as service to the team. Part Six: Servant Leadership Turnarounds – In Chapter42, Garry Ridge writes about performance management and the idea that servant leaders don’t just “grade” the work that was done but invest in helping the individual grow, both personally and professionally. 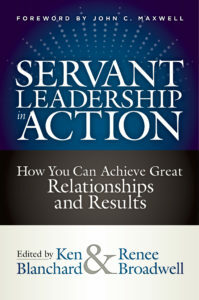 The wide-ranging yet related topics covered in Servant Leadership In Action is part of what makes the book so valuable. I am sure it will quickly become a must-have resource for leaders, both emerging and established. Order your copy here on Amazon. Read. Reflect. Grow. Inspire. Share.